Best of all, that’s just the icing on the cake: Even if you have no familiarity with anything else Price has done, this is still an immensely satisfying novel in its own self-contained right. Like the two Phase 3 books that preceded it, Samaritan is, on the surface, a mystery–almost a murder mystery, except that the victim happens to survive. His name is Ray Mitchell, and he’s a 42-year-old divorced TV writer who’s moved back from Los Angeles to his (fictional) hometown of Dempsy, New Jersey*, partly to reconnect with his estranged teen daughter and partly because he seemingly has nothing else going on. Ray grew up in Dempsy’s Hopewell Houses projects, and upon his return he’s compelled to give back to the people there with “Good Samaritan” acts like teaching a writing class at the local high school and paying for a child’s funeral. There’s a reason “Good” is left out of the book’s title, though, as all of these actions are tainted, even in Ray’s own self-assessment, with the narcissism that motivates them. Eventually someone bludgeons Ray nearly to death at his apartment, and when he comes to he refuses to say who did it. But local cop Nerese Ammons, a childhood acquaintance of Ray’s, won’t take no for an answer and sets out to bring his attacker to justice. Clockers‘ encyclopedically knowledgeable Bobby Bones if only his last name wasn’t different, and the “East Indian doctor” who appears at the Dempsy Medical Center does not turn out to be Freedomland‘s Dr. Chatterjee. One thing that makes Samaritan unique is that while Clockers and Freedomland didn’t really go out of their way to conceal the solutions to their central whodunits, the big reveal here is actually a surprise, much as it would be in a conventional murder mystery. But in contrast to many conventional murder mysteries, the solution also doesn’t feel like a contrived cheat; it’s fairly plausible and fits in with the larger themes of the story. Best of all worlds! Obviously Ray, like Kenny and Peter, is to a great extent a fictionalized version of Price himself. “By the time I went off to write screenplays,” Price says, “I’d written so much about myself that even I was bored–so in neither Clockers nor Freedomland was I a character… With Samaritan enough time had passed where I could… go back into my life and write about it without being self-indulgent.” Fatherhood is one trait that links Ray with the real-life Price of 2003, and another is writing for Hollywood; Ray’s comparison between TV writers and baseball managers (“two minutes after you get canned by one team you get picked up by another, because there’s only so many of you floating around”) is pretty much identical to sentiments Price has expressed about screenwriting. And Price’s own love of oral storytelling is obvious not just from the tales Ray tells but from those delivered by the other characters in the book as well. Price’s famous ear for dialogue is often at its best when he’s allowing the people in his novels to deliver anecdotes in their own words (and their own speech patterns), and Samaritan is a gold mine of such moments, from Nerese’s darkly funny description of her pursuit of a domestic abuser to aging ex-junkie White Tom Potenza’s saga of achieving sobriety. Nerese herself is prominent enough that she serves as a sort of co-protagonist with Ray, just as Rocco did with Strike in Clockers and Jesse did with Lorenzo in Freedomland (though the alternation of perspectives is somewhat more fluid here, often occurring within chapters rather than on a chapter-by-chapter basis). My memory of Samaritan before I re-read it for this blog was that her sections were fine but superfluous, since Ray is really at the center of the plot. Having read the book twice now, though, I think she’s essential for a few reasons–partly because she provides a more positive example of seemingly selfless behavior (much of her time and energy is spent taking care of her wayward family members), and partly because Ray’s chronic inability to genuinely connect with Hopewell lifers would be even more unbearable without an intimate, sympathetic portrait of one such person. 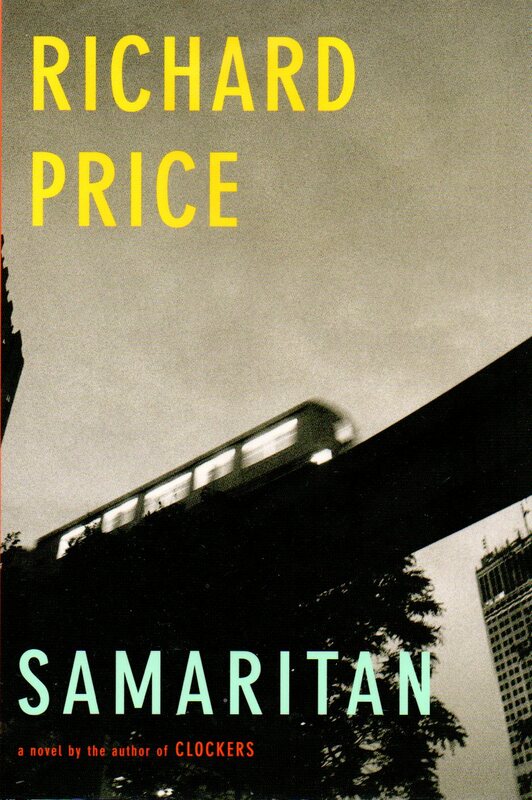 Samaritan isn’t one of Price’s most innovative or surprising books, since it builds so much on ideas and stylistic conceits he developed in earlier works. But it does so in a way that’s constructive rather than derivative, making this both a satisfying summation for longtime Price readers and a pretty good place for newbies to start. • Like the other entries in Price’s Dempsy trilogy, Samaritan opens with a Bible verse (Matthew 6:1-3). This is a tic seemingly picked up from Hubert Selby Jr.’s Last Exit to Brooklyn, one of Price’s favorite books. • This was Price’s first book since 9/11, and while that tragedy is mentioned a couple times (Dempsy being located adjacent to New York City), it’s not exploitatively mined for symbolism. Few 21st-century novelists have such restraint. • Like Freedomland, Samaritan features a minor character with the unfortunate name of Michael Jackson. It’s not the same guy, though, as Freedomland‘s MJ was dead, so either Price forgot he had already used this idea or he just really wanted to hammer home how common that name is. • Nerese’s anecdote about a cop’s cruel dismissal of a pregnant woman was apparently derived from something Price actually witnessed during his research for Clockers. • Similarly, Ray’s anecdote about his grandmother’s love of wrestling seems to have been lifted whole cloth from Price’s actual life, according to this Moth storytelling session of his. Next week: Richard Price finally enters the world of television via his contributions to the greatest TV drama of all time, HBO’s The Wire. This entry was posted in Books and tagged crime, dempsy, fiction, mystery, new jersey, novel, richard price, samaritan. Bookmark the permalink.